Following on from the successful launch of our Ladies’ Slimline Collection, Frederique Constant is delighted to present the limited edition gentlemen’s Slimline Tourbillon Manufacture. With an appearance that is at once classical and timeless, while at the same time fresh and modern, this new model perfectly illustrates all that is good, all that is exciting, and all that is unique about Frederique Constant timepieces. Individually numbered, only 188 of each Slimline Tourbillon Manufacture model will be available to the public. Each will be presented in a beautiful wooden gift box, and features a technologically advanced manufacture movement that is unique to Frederique Constant, the silicium escapement wheel and lever. The silicium movement has added greater durability, unrivalled accuracy of timekeeping, and reduced service requirements to models that were already among the most technologically advanced in the world. With a fast 28,800 beats per hour, each watch in the Slimline Tourbillon Manufacture range will not only keep time better than ever thought possible in a mechanical watch, it will also provide a 48-hour power reserve. Clean lines give the slim stainless steel case an even more sophisticated, 50’s-style appearance. The thickness of the watch’s body incredibly measures less than a single centimetre, and the beautiful, understated raw materials lend a quiet elegance, even an unspoken self-assurance to this timepiece, much like the men who wear them. Two models in the Slimline Tourbillon Manufacture range are offered; one with a polished all-stainless steel case and the other with a shining stainless steel main body accentuated with a stunning 18-karat solid rose gold bezel. 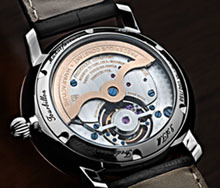 The back of the case is covered with see-through sapphire crystal, allowing owners the opportunity to see firsthand the finely decorated calibre with it’s rose gold plated rotor. The rich silver, curved dial features beautiful, rose gold-plated indices, all hand applied in-house by Frederique Constant’s skilled craftsmen and women. The dial also boasts a day-night indicator, and finally, there’s a fine view of the tourbillon cage at the 6 o’clock position. Both models feature a 60-second tourbillon, in which the seconds hand is actually an integral part of the rotating tourbillon cage. One complete rotation of the dial takes place each minute, putting both elegant beauty and incredible technology on display at the same time and in the same place. An elegant watch needs a strap befitting the timepiece it surrounds. The Slimline Tourbillon Manufacture models each come with an alligator leather strap with a folding buckle, allowing the watch to sit easily and comfortably on your wrist. 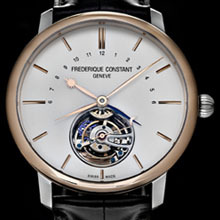 Frederique Constant has always believed that truly exceptional hand-made watches of the quality on offer in the Slimline Tourbillon Manufacture range don’t have to come at an outrageous price. 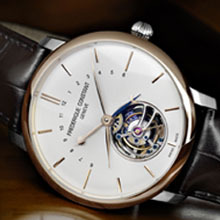 If you’d like additional information on our Slimline Tourbillon Manufacture range, please visit our website, of if you prefer, you can contact us directly. Enquiries can be directed to Mrs. Yasmina Pedrini through her e-mail address: pedrini@frederique-constant.com.